Greetings to our brightest supporters! Like you, Pearland ISD Education Foundation believes that the education we want for our children depends on bold ideas and brilliant solutions. The funding challenges schools face today are complex, but the potential to come together and raise funds for our classrooms and teachers has never been more vivid. 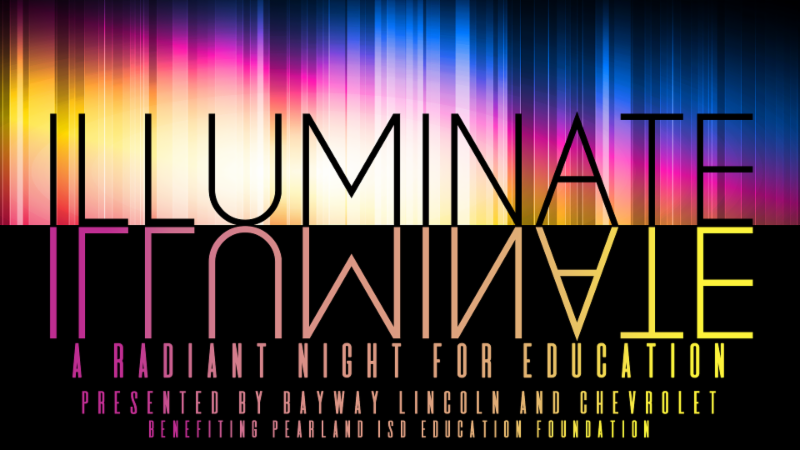 We are glowing with excitement to kick-off the 2019 Annual Giving Campaign, which culminates with our fourth annual gala, Illuminate: A Radiant Night for Education - Presented by Bayway Lincoln and Chevrolet. The black tie event will be on Saturday, March 2 at The Citadel Houston [back by popular demand!]. Guests are encouraged to wear their boldest and most shimmering colors to radiate the evening. Annual Giving Campaign and Evening for Education Gala is our largest fundraiser of the year! Proceeds fund our Innovative Teaching Grants Program, which has awarded more than $344,000 to Pearland ISD educators since 2014. Your tax-deductible support will help to move our charitable mission forward at the speed of light. To illuminate your support now, click here to download Giving and Gala information or visit www.pearlandisd.org/annualgala.